Album art. To entrust another person to illustrate my music was a scary prospect. But oh wow, am I glad I met Jessica Holly while volunteering in El Salvador last summer. I instantly was drawn to her artwork, and over many months, many conversations, and many drafts, Jess created an unbelievable visual of my music. 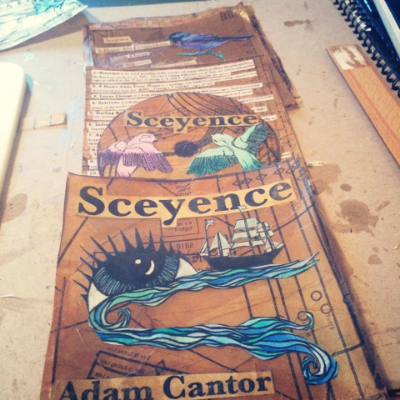 I love the imagery: eye of “Sceyence”, the ship representing adventure, the sparrows representing freedom. There are maps of El Salvador and Indiana. And the mixed media and color scheme to me makes the album feel like an unearthed archaeological discovery. Please visit her site and enjoy more of her work!